I’ve had a couple of emails following yesterday’s post about roast pork, one asking what a Yorkshire pudding is, and one asking whether I can post a Yorkshire pudding recipe. 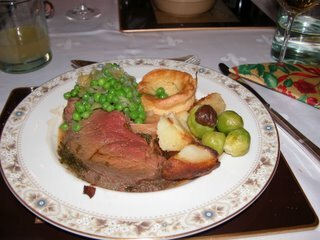 I’m very pleased to get a chance to write about this; Yorkshire pudding is a traditional English roast meal accompaniment, it’s delicious, it looks impressive if you cook it properly and tastes great. Yorkshire pudding was historically served as a first course to fire up the appetite. These days you’ll find Yorkshire pudding with gravy as a main course in restaurants in certain areas of Yorkshire, and it’s presented as a crisp and delicious side dish in homes all over the country. You need to work as fast as you can now; make sure you don’t allow the oven or the pan to cool down at all. Quickly pour a quarter of the batter in each of the oil-filled depressions and slam everything in the oven again as fast as you can. Twenty five minutes later, your puddings should have risen and turned golden. Serve immediately (a cold Yorkshire pudding will deflate slightly). These soak up gravy beautifully. Enjoy. Interesting anecdote here: My mother, who makes the best yorkshire puddings( second only to your mother obviously), always told me that the reason yorkshire puddings were served before the main course was that during the war (WW II – she’s not that old), when there was food rationing, yorkshire puddings were filling and affordable. This meant that the actual cuts of meat that people had to serve could be smaller. I’ve never had Yorkshire pudding with pork, always beef… and always as a slice of a big 8×12 pan full. Every time I see a picture of it, they’re always the little bun kinds! This makes me want to try them very badly. oh my god!!! 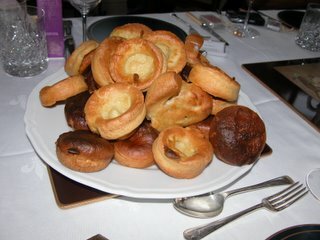 I love Yorkshire pudding but have never tried to make it. Now, armed with your amazing instructions, I will give it a go this weekend. are the directions different for the pan version? Hi Sue – no, the directions aren’t different. You should be using the same amount of fat. Enjoy! ok i made your batter as you said but must admit it is a very watery mixture? is this right? Hi Chris – and I hope your puddings turned out OK. The batter should be about the same consistency as thin cream, and the fat blisteringly hot. Let me know how it went! I’ve heard that cold Yorkshires taste nice with ice cream but I prefer mine hot. Sometimes I make them instead of potatoes and serve them with any gravy meal, even savoury mince tastes good with Yorkies.